Want to know more about Westside Motorcycle Academy? Read on to meet the founders as well as get some very important tips from certified instructors with over 15 years experience training riders. Who are the original founders of Westside Motorcycle Academy? Erika Willhite and Amanda Cunningham co-founded Westside Motorcycle Academy in 2005. They opened the first-female owned motorcycle rider-training site exclusive to Los Angeles County. Their school, Westside Motorcycle Academy, is first-ever CHP certified training site in West LA. Westside Motorcycle Academy serves riders in the greater Los Angeles area including ranges in Inglewood and Long Beach. To date, Westside Motorcycle Academy has trained over 28,000 riders. Erika Willhite and Amanda Cunningham. Both are nationally certified motorcycle instructors to teach various beginning, intermediate and advanced level curricula through the Motorcycle Safety Foundation and Total Control Training. Both have been CMSP (California Motorcyclist Safety Program) certified instructors for the last 15 years and co-owners of the first female owned motorcycle training site exclusive to Los Angeles County. How did you get in to riding motorcycles? Erika: Growing up in Ohio there were lots of opportunities to have fun on two wheels. My brother and I ordered a go-cart kit from the back of Rolling Stones Magazine, and before long we had a make shift mini bike. We would sneak the mini bike out and ride trail bikes in the country. Mandy: My Uncle Bob taught me on a farm in Vermont on a 1979 185cc Honda Twin Star. Who taught you to ride? Erika: If by “taught” you mean who put me on a trail bike with zero explanation and laughed when I popped the clutch, dumped the bike and knocked the wind out of myself? Well, let’s not name names, but it was someone I share DNA with…some years later, I did take a formal rider training class through MSF. Erika: Just like everything in life, timing is everything. The inspiration came from recognizing the lack of training options available on the Westside. I was living in Santa Monica when I got my M1 (over 20 years ago) and had to go to Corona (which is in Riverside County) to take the course. After logging 500 miles on my car to take a 3-day motorcycle safety class—I thought why isn’t there a class closer to Santa Monica and Venice where the concentration of motorcyclists is the higher than any zip code in LA county? Westside Motorcycle Academy opened in 2005 to fill that need. 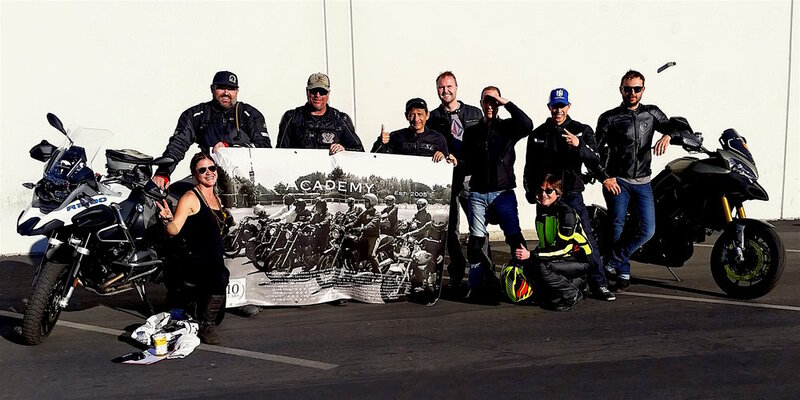 We were the first and only CHP-certified motorcycle training school in West LA. In 2007, we expanded to Inglewood and most recently a few years ago to Long Beach. Since running our first class in October 2005, we have trained over 28,000 riders in the physical and mental skills to become safe, responsible riders. Mandy: While taking an advanced rider course in Massachusetts, I was asked by one of the Instructors if I’d be interested in training to be one. A few months later, I took the 7-day boot camp and became an MSF Instructor. I quickly realized I was the second female instructor in the state. My goal in becoming an instructor was to inspire other women, to participate in a predominantly male dominated sport. It’s a thrill to go from teaching all men in 2001 (with the occasional woman) to now seeing women making up to half (and sometimes more than half) of our student population. Give us some stats on what are the most common types of motorcycle accidents that occur? Single vehicle motorcycle crashes and fatalities most frequently occur in corners. Running wide into a car is not the cars fault. Riding over the cliff is not the roads fault. The reason is rider error. Speed (and by speed, I mean going in too hot) is usually the reason. When was the last time you heard a rider ran off the cliff going too slow? Entry speed is the key to setting up your corner correctly. Error on the side of braking more before the corner, because slower is safer. There is a saying in racing, “slower is faster”…the slower you enter the corner, the faster you can accelerate through the curve. Another red flag when riding is intersections. Riders are most likely to get into an incident with another vehicle at an intersection. A green light does not always mean go. It means, “Hey!” I’m about to enter the place I am most vulnerable with other traffic. When getting on your bike the question is not, “I wonder if I am going to get cut off today?” The question is, “I wonder how many times I’ll get cut off today.” With that mindset you are looking for hazards, anticipating problems and setting your self up with the mental skills to execute to avoid getting hit. What do you feel are the most valuable skills a rider can practice? The best skill to have is confidence. The only way to feel confident is to ride a bike that fits you well and put the saddle time in to develop your skills. Riding a motorcycle is not rocket science. It is practice and repetition. Get bored out of your mind riding in a safe-controlled environment. Take a class to make sure you are practicing the right techniques and feel confident learning the lean angles and weight distribution of your bike. The life-saving skills are the ones we emphasize in our skills practice and refresher courses. Those skills are cornering, quick stops, escaping quickly and swerving. We also work on slow-speed tight turns to help riders feel more comfortable and confident when they ride. What are the most common mistakes you see new riders make? On the macro level, I think the biggest mistake new riders make is equating being legal with being safe. A lot of people think that since they legally have a license to ride a motorcycle that means they safely can ride any motorcycle. In reality a motorcycle is as safe as the person riding that bike. Earning an M1 endorsement by taking a 3-day course on one of the smallest and lightest street legal motorcycles manufactured, in a parking lot with no cars and traffic at novice level speeds does not equate to riders having all the skill and ability to safely operate every motorcycle. In 33 states in the USA, a rider can pass a 3-day motorcycle safety course on a small training motorcycle and earn an M1 in which they are legal to ride any size bike. So in theory, a person who rides for 10 hours on a 250cc motorcycle in a parking lot earns an M1 and can legally ride an 800cc BRW, an 1800cc Road King or a 2200cc Triumph Rocket. They legally can earn a license to ride something 11 times bigger than the motorcycle they rode to earn their endorsement. Being legal does not equate to being safe. On the micro level, the two most common mistakes new riders make are looking down and covering the front brake while riding. The bike goes where energy flows. Looking down is a bad habit and it is not safe. The one thing that makes a good rider faster than anything else, in my opinion, is when a rider has their head and eyes up looking as far ahead as possible. Take off with your head and eyes up, ride with your head and eyes up and stop with your head and eyes up. Keeping your eyes up allows you to look for hazards while you ride and also helps build muscle memory while you ride. Covering the front brake while riding is also a common mistake new riders make. The general rule for balance: speed is stability. Think of things you do that require balance: riding a bicycle, snow boarding, stand up paddle boarding, rollerblading—with all balance activities, the slower you go the harder it is to balance. Brand new riders (usually that are nervous of speed) will sometimes ride covering the front brake, because they think that will help them. When in fact, it is just the opposite. Covering the front brake means a rider is rolling on the throttle with the palm of their hand. Since speed is stability and the throttle is the control that is used to increase the speed of the motorcycle, the rider has better throttle control (and better stability) wrapping four fingers around the throttle while riding. What are you goals with WMA? In a few months we will be entering our 14th year of motorcycle safety training. We have seen some of our past students go on to greatness while starting their road riding with WMA and sadly, there are at least 2 who are not here today due to having had a fatal motorcycle accident. Our goal when we started was to create a premier training site in the greater LA area to serve riders with the best rider education curricula available. And while we continue to serve our community and work with the stakeholders in providing rider education, we are on a mission to reduce motorcycle fatalities. We know from the research that motorcycle fatalities are reduced when a rider takes additional training classes on their own personal bike. Over the last two years we have developed a concise and comprehensive curriculum for those who are vested in staying safe on the road. We created and conduct the WMA Riding Refresher with the goal of creating a place and a space where all riders and all levels are welcome. There is no pressure of passing a test. The goal is simply to become a better rider. First of all, ride like you are invisible for the first 6 months and always wear your gear. (Statistically speaking, new and re-entry riders get into an incident within the first 5 months of riding.) The operating assumption cannot be others will see you. The operating assumption has to be that drivers are often distracted, texting, talking on the phone or maybe they have never been trained to watch out for motorcyclists. And in terms of purchasing a motorcycle, make sure you find the right fit for your style, size and ability. Going too big, too soon is a recipe for disaster and the learning curve goes way down. Your dream bike might not be the first bike you purchase. Go with something small to start with. Ride like you are invisible. Continue to get training. What advice do you have for more advanced riders? There are a lot of amazingly talented motorcyclists in and around Los Angeles and California. No matter how good you are—there is always someone better than you. So, while you may have more experience and skills than a lot of riders, there are those that have more than you. With that in mind, it is important to ride your ride. Avoid the temptation of getting carried away in the moment thinking you have to prove yourself to someone on the road. If you are riding with a group who is going faster than you feel comfortable going, trust your gut. If something feels off—it is off. That gut feeling, intuition, whatever you call it is non-negotiable. We all need to be more mindful in our riding practice and continue to develop and sharpen our riding skills. Continue to take classes. Try to be open and ask, “What can I learn?” or “How can I improve?” Be confident without being cocky. It is an incredible privilege to ride a motorcycle. And, with privilege there comes the responsibility to yourself, your friends and family, the riding community as a whole to stay safe. That means continue to take classes, ride with all your gear on, ride sober and ride within your limits.